When you are a writer, doing research is part of the job, and oftentimes it takes up a major portion of our preparatory time. If you are an author working on period stories, like I am with my Jason Dark dime novels for example, this research is typically even more encompassing. In order to ensure accuracy of the material presented to the reader and to give it more credibility I am oftentimes spending days on end researching history. In many ways I consider myself a history buff, which is kind of strange because, like virtually everyone I know, I always hated History in school. So where did the change come from? To be perfectly honest, I think I’ve always had an interest in history, but the education system I went through in Germany did a fantastic job in maiming all and any such interest. I have never gone to an American school so I do not know how they treat history here, but my general understanding, judging by people’s overall state of education in world events, it seems even more neglected. As I think about it, I believe there are two main reasons why history classes must be some of the most tedious and unattractive paths in school. The first reason is the way the material is being taught. I don’t know about you, but I had to learn reams of dates by heart for years in a row. That, in essence was my history education throughout school. Every grade covered a different time period and we, the students, were expected to remember key dates and events which were prodded into us in lessons during which we would pour over stuffy explanations and date listings of said events. I mean, really, life doesn’t get any more boring than this. History out of context is as exciting as watching water evaporate; there’s just nothing there to hold your attention. I honestly wish my history teacher would only have asked a question like “Imagine for a moment that you Lord Nelson and you want to defeat Napoleon Bonaparte at sea. How would you do it?” I am sure, it would have sparked an interest in the topic for a lifetime, instead of killing it off by forcing students to simply line up all the dates and events ad nauseam. To make matters worse, from my experience, history teachers are every bit as dry, boring and uninterested in the subject matter as the way they teach the material. In retrospect I realized that even my Latin teacher did a better job at instilling a love for history in me. He would take us on field trips to excavation sites and Roman monuments, allowing us to see first hand the influence and impact Roman culture had had on the world we lived in. This has instilled a love for Roman history in me that is still very much alive today. When you look back, what was it that inspired your love in history? In my case it was movies and documentaries. Watching Holocaust in the late 70s was the first time I was really able to put real faces to the pain and horrors of the Third Reich. I began to associate real people with these horrendous events, not printed names, realizing that these were not just dry dates in a text book but the lives of people with hopes, lives, ambitions and love in their hearts. The series left me heartbroken. There were many others and I’ve found that even the most romanticized Hollywood movie can make for a better history lesson than an hour with any of my history teachers. Some of these movies may not be entirely accurate, some of them may be biased, but the important thing is that people are becoming engaged in history and potentially interested, which is a lot more than what my text books and history classes did. I’ll be honest with you; the Ides of March or probably the only historic date I remember from all the studying in school — and once again that comes courtesy of my Latin teacher and his way of playing out the assassination of Julius Caesar for us during a field trip to some Roman ruins. Other than that, I have zero retention of my academic history lessons. Yet the events depicted in Holocaust or even Braveheart, Band of Brothers, I, Claudius, Elizabeth or John Adams have firmly become part of my historical vocabulary. I now know that William Wallace was one of the most passionate freedom fighters of Scotland and not, perhaps, the brother of mystery writer Edgar Wallace. I now know that John Adams was not only a president, but one of the key figures in giving us the freedom and union we enjoy every day, fighting for it on political turf instead of the battlefields. As a result of Valkyrie I finally saw a real person and his convictions behind the infamous attempted assassination of Hitler by the man whose wife and children used to live only down the street from my apartment. He became more than just a name in a book and a plaque and suddenly his efforts and sacrifice grew to dramatic proportions. Strange as it may seem, Young Indiana Jones has been critical in generating interest in certain historic events in me that I then investigated further. As a result I came to understand how people like Lenin managed to get to power, among many other things. So, you tell me, which one did a better job at relaying information… my school education or dramatized works of entertainment in the form of biopics and even fiction? I know there will always be the purists who clamor that the weather depicted in a scene was not accurate or whatnot, but in my opinion they are missing the point. History is worthless if no one takes an interest in it. In order to create interest, history has to be dramatized, which means that occasional liberties have to be taken. These days I soak up history whenever I get the chance. As I get older I find it easier and easier to see how one event led to another, how people corrupted by power continually exploit others, creating intolerable conditions for the rest. History is every bit as much about strategy and political intrigue — both of which is typically filled with natural drama — as it is about dates and names. It all holds a fascination for me that I just can’t escape and I enjoy every minute I can dig into historical research and uncover new facts and information that were previously unknown to me. If you’ve been following the discussion on J.A. Konrath’s blog before the weekend where I guest-blogged about the success of my Jason Dark series — or its lack thereof — you will have noticed that there were a large number of comments, opinions and suggestions. In the aftermath of the public bloodletting I am currently in the process of weeding through these comments to separate the wheat form the chaff — to dig out the few gems that were there. The idea of the guest-blog, for me, has always been to put my feelers out and see how other people perceive my books because as the author and publisher it is hard for me really see it in an unbiased way. At the same time I am a very critical person, which can easily be evidenced by the way I conduct my business. Even J.A. Konrath took note of that, evidently, when he said “I’ve never seen a more professional self-published writer.” It was a statement that made me incredibly proud because it is exactly what I have been striving for for all this time. I see myself as a professional, not an amateur or hobbyist, and when I guest-blogged on Konrath’s blog, inviting comments, I looked upon it as a focus group. I’ve been tallying up all the comments and sort of weighed them in my own mind. Naturally, there are some that I dismiss right off the bat others were truly thoughtful and offered insight into how other people look at books and authors they are not familiar with, even when that audience consisted mostly of fellow indie writers. In response to the comments some of you might be interested to hear that I have already rewritten the opening of “Demon’s Night.” While I do not agree with all the comments that have been made on the subject of my writing, I did take Moses Siregar’s dissection very seriously and appreciated the time and effort he put into it. Since “Demon’s Night” was the first book I ever wrote, plus I rote it in English, which is not my native language, clearly there is room for improvement and I intend to take another close look at the story to see how I can make it a stronger contender in the field. It also struck me that there seemed to be quite some confusion regarding the “series” character of the books, something I have noticed on a few occasions before. For some reason, people seem to be under the impression that the books are actually one big story arc that has to be read sequentially. I always felt that the fact that each adventure has its own title, a distinctly separate storyline that is outlined in the flap copy was enough to convey the episodic nature of series in which each story is an adventure of its own, featuring the same principal cast. Evidently, I did not do a good enough job because it became evident that the confusion was running deep. As a result I will completely rebrand the way I am presenting the books. Each will be represented as its own, with a title that says something like Demon’s Night, a Jason Dark supernatural mystery. There will be no more volume numbers or overt references to the series as a whole as part of the book listings or descriptions and hopefully this will make it possible for people to hone in on individual books regardless for their place in the overall series. The subject matter – demons, vampires, angels or whatnot of each individual book will then become the focal point instead and hopefully this will give each book a better shot at its own life. In the process the descriptions for each book will also be overhauled to make sure they are as crisp and gripping as possible — though that is a very malleable term all in itself. In addition I will revise the covers of the books. I am not sure yet how to do this and which way to go, but the general idea is to create a signature look for the series to allow easy identification of the “Jason Dark supernatural mysteries.” In the process of this there is a good chance that I may steer away from the original cover artwork also, though, we’ll have to wait and see. Either way, all the feedback I received as a result of the guest-blog has been tremendously valuable and I am grateful to everyone who made their opinions known. Okay, it is time for me to finally make good on my promise and turn your book’s HTML source file into a proper eBook. All we need is a little software called Calibre that you can download here. I want to take a brief moment to point out that Calibre is a free software package and I cannot thank its developer Kovid Goyal enough for putting so much time and effort into this program. Not only is he putting all the effort into writing the application and improving it constantly, Kovid is also very active in his support forums and tries to help everyone with problems whenever he can. So, please feel free to support his restless efforts by perhaps donating a few dollars for the cause. You will find a button on his website and maybe you’d even be willing to commit a small amount every time you actually prepare a new book for publication using his software. All right, now it’s time to get serious. One of the great things about Calibre is that it allows us to build a variety of eBook formats from the one source file we have so carefully crafted. The first thing we need to do is to add our new book to the Library. Simply click on the “Add books” button in the upper left corner and select your book’s HTML file. A lot of people do not know that you can actually use an HTML file as a book source in Calibre, but as I pointed out, not only is it possible, it is, in fact, the most reliable way to create a predictable output. Once you have done that you will see the book appear in the top line of the Library listing. It may have a strange name at this point – Calibre uses the HTML file name by default – but we will fix that in a second. The next step is to edit all of our book’s meta data. Highlight your book in the Library listing and then click on the “Edit metadata” button in the toolbar at the top. You will now see an input form that allows you to insert all the relevant information about your book on the left side. Most of these fields should be self explanatory, though the “Author Sort” line might be confusing. It is used to allow you to use your last name for sorting. So, instead of “Guido Henkel” I would enter “Henkel, Guido” here. The large “Comments” field at the bottom is used for your product description. Simply enter your whole flap copy here, your synopsis or whatever you want to call your product description. Moving on to the right side of the input window you will see a block that is called “Available formats.” Currently it includes only a ZIP file, which is a zipped-up version of our HTML source. Do not do anything else in this block. We will get to it at a later stage. Finally, lets include the cover of the book into the meta data. This is the cover that will be included in the front of your eBook. It is not the cover that is used by distribution channels to list your book! It is the actual cover image inside the final eBook. I always create a cover that is at least 1280 pixels wide for use here. Even though many eBook readers do not support color at this point this is nothing you have to worry about. The device will automatically convert this to a grayscale image for you. Purists may say at this point that you should actually create an optimized grayscale image for inclusion for better quality. For the most part I found this not necessary. While the end result might be a tad better – and I stress might here because eBook readers are still notoriously bad at displaying images in general – and while the file size might be reduced, I found the tradeoffs not worth it. Not only would you have to create separate versions for color and grayscale readers, but with the growing proliferation of color devices, you will make it possible for Kindle readers on the iPad, for example, to enjoy the full color version of your cover. That alone should be reason enough to stick with the color cover. Select “Browse,” find your cover and make sure it displays properly in the meta data window. We now have all our meta data and it is time to click “OK” to make sure they are saved. Next, click on the “Convert books” button in the toolbar at the top of the screen. This is where the rubber meets the road – from a technical standpoint. Here you find the modules that actually turn our source HTML file into the various eBook formats. While all the menu entries and names might seem extremely technical to you, I will guide you through here to make things easier to understand, especially since most of the technical parameters are identical regardless of the selected output format. Which reminds me… let’s select an output format. In the upper right hand corner you will find a drop-down menu allowing you to select the output format you want to build. For our purposes right now, select EPUB, which we will be able to use for the Nook, the Apple store, Kobo, Google Books and other outlets. On the left side of the input window you will see a column of icons. these icons give us access to the different settings for the ePub compiler. Most of these parameters we will leave untouched as the default settings that Calibre provides are real world common sense settings. In fact, we could already press the “OK” button at the bottom of the window and get a decent eBook out of it. Perfectionists that we are, however, we want to take things a little bit further. Calibre uses this section to determine your book’s structure so that it can format it properly. For example, this can be used to create page breaks before a new chapter. In fact, it is the default setting. The reason I am taking you here is because in case you do not want to include page breaks here, you will need to switch it off by selecting “None” from the “Chapter mark” drop-down menu. Next stop, our table of contents (TOC). Select the “Table of Contents” icon so we can tell Calibre how to automatically build a fully linkable TOC and include it in our eBook. Since we have been using a special stye in our HTML file to manicure chapter headings, we can now use this style to tell Calibre where each chapter starts. in the field for the “Level 1 TOC (XPath Expression)”. It tells Calibre to look for all instances where the style “chapter” is applied and add them to the table of contents. Calibre will automatically use the entire chapter heading text to display in the TOC, which means the entire block of text that is style with the “chapter” style. From my experience that is exactly what we want. If not, you could narrow the selection down further using XPath expressions to drill down further. If you want to learn more about XPath expressions, feel free to check here. The last step before we build our book is found in the “EPUB Output” section. Select the icon in the left toolbar and you will find a checkbox entry that says “Preserve cover aspect ratio.” Make sure to select this as otherwise your cover will be disproportionally scaled to fill the entire display of any eBook reader. I am not sure why this is not checked by default, but so be it. That’s it. Click on the “OK” button and you will notice that Calibre is doing some work in the background. It will tell you so with a small animation in the lower right hand corner of the Calibre window. This will take a second or two, depending on your computer’s speed and the length of your book. But once it is done we are ready to save the finished eBook. Click on the “Save to disk” icon in the top toolbar and select a location where you want the book to be saved. Now it is time to take a look how things turned out – it is the big moment. While it is possible in to use Calibre’s viewer, I found that despite the overall quality of Calibre, the viewer is – at the time of this writing – not at all representative for what your eBook really looks and behaves like on a real reader. For first checks I always use the software versions of the Kindle or the Nook reader or Adobe Digital Editions. These will immediately give you the results you’re looking for, especially since many people use these application to actually read their books on. However, you should always make sure to also load you books onto the actual devices, if possible, to see they behave properly. It is always better to make sure than to make assumptions and extrapolate from a software implementation running on a desktop computer. When I load an eBook up for the first time, there are usually three things I checked first. Does the cover display correctly? Are there proper page breaks before chapters, and do the chapter headings display properly? Does the book contain a complete and working table of contents? Once you have made sure these are in order, you should begin to browse the book very carefully from beginning to end. Look particularly for passages where text switches suddenly to italic text. Particularly when have inserted the <i> tags by hand, it can happen all too easily that you accidentally forgot to close the tag properly, or you mistyped it. Only a visual inspection of the book, page by page, will make sure your text is in order, so take a few minutes and go through it. If there are errors in your source file you will have to go back and edit the HTML file. What is important is that once you have made the changes, you will have to re-import the HTML file back into the Calibre book. In order to do this, click on the “View metadata” button again to bring up the meta data input form. You will see that the box saying “Available formats” now also includes an EPUB entry. Delete all the entries here, MOBI, EPUB and most importantly the ZIP entry. Simply select them and hit the “Delete” key on your keyboard to get rid of them. All we have to do now is bring the HTML file back by clicking on the icon with the red book and the plus sign in the right hand corner. Select your corrected HTML file and then go ahead and rebuild your eBook file. Save it and check to make sure the errors have gone. Once you have confirmed that everything is as it should, it is time to build the other formats. Select MOBI from the drop-down menu in the “Covert books” form. chances are you will not have to change anything else, as the structure and TOC settings format independent, and because MOBI does not require any format specific adjustments. Build the eBook and save it. Congratulations, you now have proper EPUB and MOBI ebook versions of your book that are virtually guaranteed to be free of the most common formatting errors found in today’s eBooks. To distribute your eBooks, all you need to do is send the .epub or .mobi file to your customers via email, or to upload them to Amazon, Barnes&Noble, or whichever outlet you want to serve. In case you were wondering, the eBook files contain all the graphics and images that are needed, so you will not have to send the JPG images with it. They are safely embedded directly in the files so that they can’t get lost. I hope I have been able to help you with this series to understand that in order to create quality eBooks it is not only necessary to tackle the problems by their roots, but also that it is not nearly as intimidating a process as one might think. Building an eBook from the manuscript to the final build can be done well under an hour if you’re familiar with the workflow. In fact, formatting my own “Jason Dark” titles, usually takes me no more than 15 minutes. Let me know how this series has helped you, and let me also know there are subjects and issues that you’d like discussed in more detail. I’ll definitely see what I can do and highlight these issues in follow-up posts to this series. In addition, if you wish to hire me to create your eBooks for you, feel free to send me an email. Lastly, if you enjoyed this series and found it helpful, please feel free to support my efforts by purchasing one of my books. You can find them here at Amazon, Barnes&Noble or on the official Jason Dark: Ghost Hunter website. Part I • Part II • Part III • Part IV • Part V • Part VI • Part VII • Part VIII • Part IXNeed help with an eBook project? Check here for more information. If you want to keep up with my eBook formatting work, don’t forget to subscribe to my Newsletter. 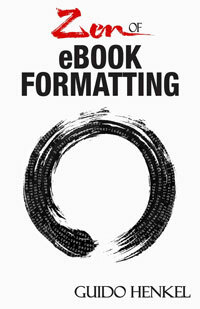 That way I can keep you updated about the latest developments, updates to my books, code snippets, techniques and formatting tips.Also, don’t forget to check out my book Zen of eBook Formatting that is filled with tips, techniques and valuable information about the eBook formatting process. There has been a lot of discussion in recent months about the pricing of eBooks, most of it stating that eBooks are too expensive and that prices need to come down. Seth Godin made a post on his blog recently pointing out that eBooks don’t really compete with traditional books but with mobile games, music and downloadable movies. While there is probably a tiny bit of truth in it, I do not like the intimation that as a result of it, eBooks should come down in price. Why? Because for the most part, eBooks are actually sensibly priced. Making a general, sweeping statement like that of Grodin creates the illusion that all eBooks are too expensive, when in fact it truly relates only to a portion of the market that is getting smaller by the day – that of major publishing houses. What it overlooks entirely is the flood of self-published eBooks that is swamping the market to the point that it actually chokes outlets. Most of these books are very low in price – too low, as a matter of fact – as they are not priced to create a sustainable business. Instead most of these indie authors price their book based on a fear factor, hoping they could grab readership that way that would then miraculously turn into profits some time in the future. Nothing could be further from the truth, but if these authors want to get into this race the bottom, let them, I say. I’d rather see them help build a solid industry that is cohesive in its approach and makes use of the lessons that can be learned from comparable industries, such as the music and games industry, but the fear of failure seems to be too deeply rooted in most first-time writers. The problem with general statements like Grodin’s is that people will look at it and echo the sentiment, never realizing that his criticism was actually pointed towards the NY publishing houses who still charge up to $15 for an eBook – the same as they do for a mass market paperback. These prices are not sustainable, there can be no doubt in my mind, but when people begin to complain that $2.99 for an eBook is too much we are beginning to have problems. On many of the message boards I frequent I see posts where readers ask “Why are eBooks so expensive?,” citing $4.99 books as examples and shortly after you will see people pointing out that all eBooks should be 99 cents. It worries me to see this kind of sentiment in consumers, to be honest. It is bordering on an insult, really, as if the time, effort and intellectual work that went into the creation of a book was entirely worthless. Being a price-conscious consumer who expects quality is one thing, but being the guy who demands everything for free is something different entirely. It is important that we remember the value books have, not in terms of dollars and cents, but in enjoyment, emotion, pleasure, fright, drama and overall entertainment. Can you still, with a clean conscience, demand that eBooks should be only 99 cents? When you read blog posts and articles about people calling for lower eBook prices, remember that this is not a call to a universal 99 cents price point, but a wake-up call for the fat cats in the NY publishing houses, who still believe that having an illiterate like Snooki “write” a book is a better idea than giving an actual writer a chance. Those guys have completely lost touch with their readership a long time ago. The only thing they are concerned about is to cater to their stock holders and board of directors so they won’t get fired. But guess what? If they keep up making those ridiculous decisions regarding their content and price tags, they will find themselves looking for life preservers before this year is out.